Extensive range of 32 highly concentrated colours. May be purchased individually or in sets. A unique, transparent, highly pigmented water-colour ink powders giving wonderful bursts of colour when used, exclusively manufactured by us at our factory in Sheffield. Brusho® crystal colour offers a very good degree of light fastness. Totally intermixable, Brusho® can be used for everything from painting scrap box models and the burst of colour achieved when using our simple sprinkle techniques is perfect for background colours on paper, card and fabric , to water colour design work and wood staining. Outstanding effects can be achieved when Brusho ® is used for design work/decorative effects on fabric e.g. for wall-hangings etc. (Not fixable on fabric). 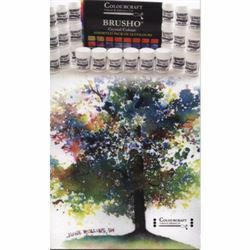 Brusho® is used in educational establishments at all levels and by all age groups - by primary school children - professional artists - teachers and lecturers in art and craft etc. Even after many years of using Brusho ® new possibilities will still be found for this highly interesting product. Illustrated leaflet giving some ideas and techniques supplied with each order, together with simple stippling technique and shade card. Non-Toxic.